Break out of the box with this fantastic crochet book. 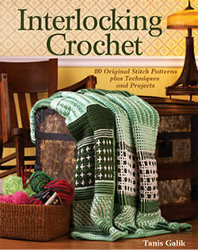 Interlocking Crochet by Tanis Galik provides 80 patterns as well as guides to various crochet techniques. This book is divided into three sections: interlocking basics, single designs (same design on both sides) and double designs (different designs on each side), and projects. Galik has also included all pattern corrections inside the front cover of the book. Interlocking crochet is also known as double filet, intermeshing and interweave. You can make everything from homemade scarves to afghans to ponchos using this technique. If a new technique seems like an intimidating task, don't worry! This book features step-by-step instructions as well as color photos that are clearly labeled. There are also notes on many of the patterns to clarify the steps and add insights. Galik provides personal pattern tips on some of the patterns that explain her own experiences. She also provides plenty of helpful hints along the way! In Interlocking Crochet, you'll find patterns for ponchos, purses and scarves. The afghan patterns in this book include the Pink and White Blocks Baby Blanket (p. 106), Happy Colors Baby Blanket (p. 109), Panel-By-Panel Afghan (p. 112) and A Dream In Cream and Green Afghan (p. 118). Each one is intricate and pretty but so unique. Galik, who has been crocheting for almost 50 years, is truly an expert on interlocking crochet. Her writing style is easy to follow and understand. Step outside the box and create crochet projects you can be proud of. I agree with devinewilco's comment about watching online. Makes all the difference! Sounds interesting. I would love to try the patterns.